Ever since Empire of Sand was announced, I knew I had to read it. A Mughal India inspired fantasy from a debut author? All of this screams my name. And I was not disappointed in the slightest. There’s nothing I love better in fantasy than epic and immersive world building. Talk about a book where I could feel the desert heat on my skin and sand underneath my feet. 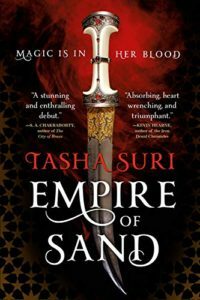 The physical world doesn’t only sweep you away, Empire of Sand is full of myths, magic, and injustice in your blood. It’s a book about forbidden magic, a war against a religion, and the need to hide in plain sight. Empire of Sand talks about when we have to work for our enemy, the importance of choices, and the power of love freely given. When we make a choice with a knife at our throat, when we’re backed up against the wall, our feet dangling over the edge, our choice becomes an illusion. We examine the nature of choices, what it means to make a vow, and how we can resist. I think that’s what I loved the most about the book – the interplay between resistance and desire. When we are forced to make a ‘choice’, how can we resist? Is it in the active small acts of rebellion? The interpretation of words, these fickle tools we mold. Is it in our choices to keep our thoughts to ourselves? To know what is true within our hearts? All of these methods of resistance and agency are examined within Empire of Sand. What is truly ours that we can hold on to at the end of the day? Can we bend and live to fight another day? It’s the importance of choice, of love freely given. Of sacrifice with choice. The importance of agency and being able to choose who you give your heart to, which path your feet find, and the power beneath your skin. I adored Mehr. The ways she acknowledges aspects of her privilege – the fact that she hasn’t been trained for a skill – all while being incredibly intelligent. She sees how the servants and her family treats her as she is hated for her heritage. All while being bound by her blood, needed for it, even as the empire pushes her people to the brink of extinction. She has to learn how to be more clever as she is thrown head first into a nest of vipers. But the constant choices she makes, ways she acknowledges her mistakes, is really refreshing. As Empire of Sand develops, Suri weaves other perspectives into the book, into the world. Empire of Sand is a book about resistance, the power of love, and the ability we have to choose our own destiny. Not to mention that this book is diverse and ownvoices. If you love fantasy, love stories, and incredibly rich books, then you have your next recommendation from me. Find Empire of Sand on Goodreads, Amazon, Indiebound & The Book Depository. What book is your most anticipated release of 2019? Sounds like this one has pretty powerful themes. Great review!